Tuberculosis (TB) is a bacterial infection spread through inhaling tiny droplets from the coughs or sneezes of an infected person. It mainly affects the lungs, but it can affect any part of the body, including the tummy (abdomen) glands, bones and nervous system. TB is a serious condition, but it can be cured if it's treated with the right antibiotics. You should see a GP if you have a cough that lasts more than three weeks or you cough up blood. Read more about the symptoms of TB and diagnosing TB. TB is a bacterial infection. TB that affects the lungs (pulmonary TB) is the most contagious type, but it usually only spreads after prolonged exposure to someone with the illness. In most healthy people, the body's natural defence against infection and illness (the immune system) kills the bacteria and there are no symptoms. Sometimes the immune system can't kill the bacteria, but manages to prevent it spreading in the body. You won't have any symptoms, but the bacteria will remain in your body. This is known as latent TB. People with latent TB aren't infectious to others. If the immune system fails to kill or contain the infection, it can spread within the lungs or other parts of the body and symptoms will develop within a few weeks or months. This is known as active TB. Latent TB could develop into an active TB disease at a later date, particularly if your immune system becomes weakened. Read more about the causes of TB. With treatment, TB can almost always be cured. A course of antibiotics will usually need to be taken for six months. Several different antibiotics are used because some forms of TB are resistant to certain antibiotics. If you're infected with a drug-resistant form of TB, treatment with six or more different medications may be needed. If you're diagnosed with pulmonary TB, you'll be contagious for about two to three weeks into your course of treatment. You won't usually need to be isolated during this time, but it's important to take some basic precautions to stop the infection spreading to your family and friends. If you're in close contact with someone who has TB, you may have tests to see whether you're also infected. These can include a chest X-ray, blood tests, and a skin test called the Mantoux test. Read more about treating TB. The BCG vaccine offers protection against TB, and is recommended on the NHS for babies, children and adults under the age of 35 who are considered to be at risk of catching TB. The BCG vaccine isn't routinely given to anyone over the age of 35 as there's no evidence that it works for people in this age group. Read more about who should have the BCG vaccine. 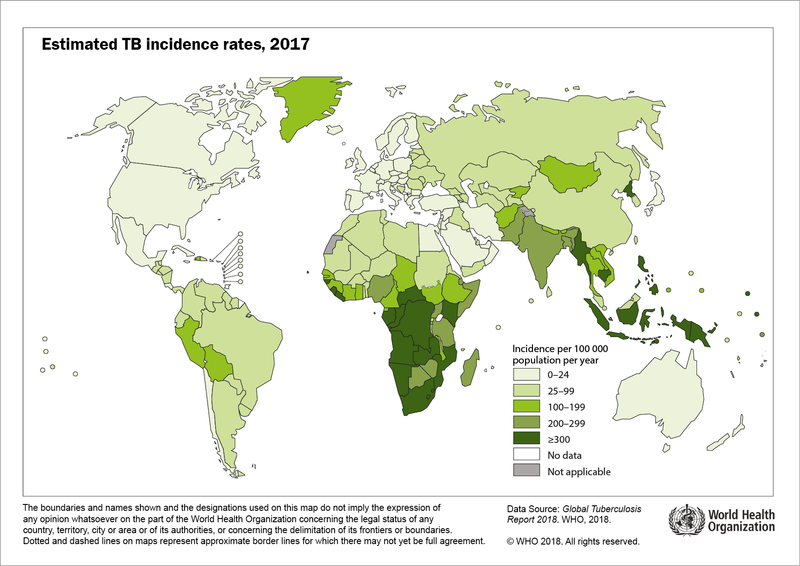 The World Health Organization (WHO) has produced a world map showing countries with high rates of TB.